Completely stupid. 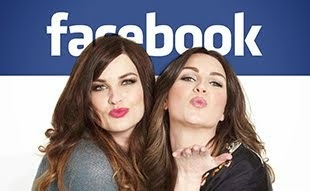 Basically, the person with the most facebook friends wins. 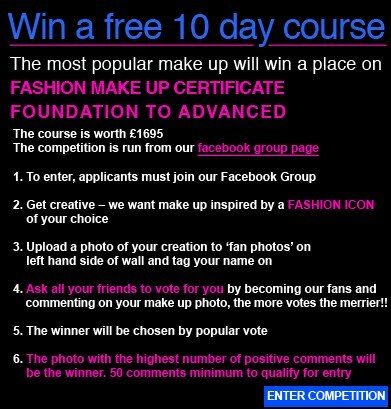 Pat McGrath could enter this competition only to lose to Jane from Staffordshire who has 2600 facebook friends. At least the Jemma Kidd competetion was judged by people who work in the business and can recognise talent. If you use facebook you're probably gonna vote for a friend even if their make-up looks like a 4 year old finger painting. Ridiculous. I agree a bit with Xanthiax, it is basically based on popularity, people will vote for friends and will not even bother to check if it is the best. Would be better if it would be judged by a panel that works on the business! Hi Girls. If the competition is about makeup it should be judge by people that work in the business. When I saw the Post, my will was to participate. But when I saw the rules, I was kinda sad because my marketing skills are not very good and because I want to be judge by people that really understand my work! This Post that I´m writting is just an outflow. I will be waiting for the next competition that can be judge by talented people like you =) Kisses! I agree with the comments above. Theres no way this will be a fair contest based on make up creativity unless it's judged by objective people that are in the industry. ( Still i hope we are all proved wrong and someone amazing wins. We appreciate any feedback and have taken note of your comments. method for a number of reasons. will be voting, not just the entrants' friends. This competition publicised MUSE before the details were even published. I 100% expected to participate when pixiwoo released details of a future competition on this blog - and since a lot of people follow them here and on youtube, I'm pretty sure a lot more people now know about the company than they did a week ago. I've been wanting to go on a make-up/fashion course for a while now, as I'm sure pretty much all of the people who follow pixiwoo do, and this competition could have been a great way for a lot of people to get creative in the hope of achieving that goal... but with such a pointless way of judging a competition worth so much (and not just in prize money) I expect it deterred more than just me. By allowing the public to judge, it opens the floodgates for people with 0 talent and passion for make-up to enter and get a free qualification for having hundreds of e-friends. Is MUSE not fit enough to judge this for themselves? Great competition :D Thanks for this! Im excited for this contest! Thanks for the opportunity! Damn, I don't have ANY fashion icon because I'm an adult with own ideas. So, I can't take part in it. But good luck to the contestants! i can't believe these lovely ladies are kind enough to offer this yet people have the nerve to complain. unreal! let's be a little more gracious people. geesh!